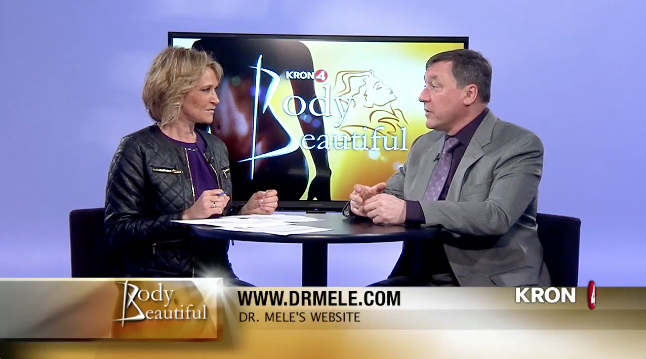 Dr. Mele discusses Cosmetic Plastic Surgery on Body Beautiful – September 12, 2017, at Noon. Hey San Francisco Bay Area. Body Beautiful will be broadcast this Tuesday, September 12, at noon. You may not have noticed, but KRON 4 was acquired by Nexstar. The good news is that they have decided to continue Body Beautiful, so I’ve got new Plastic Surgery News to share with you. KRON 4’s Body Beautiful with Vicki Liviakis and yours truly on the San Francisco Bay Area’s News Station. I have been doing Body Beautiful live for the last 10 years. The original show was with host Vicki Liviakis, and we would take viewer calls live, on the air. It certainly added excitement. Since we were on the air live, even the “unusual” questions had to be answered. The latest version of Body Beautiful with host Janelle Marie. Now Janelle Marie is the host, but the format remains the same. This week’s show was taped last week. Maybe KRON’s new management was a little nervous about an amateur, me, on the air live. But don’t worry, you can still submit questions for the show via email or the contact form here in the margin. The links above will take to more detailed information about these procedures. Body Beautiful will be broadcast this Tuesday, September 12, at noon. Be sure to tune in or set your DVR. I you miss it, don’t worry. I will be posting the segments from the show here, and the San Francisco Plastic Surgery Blog and on my YouTube channel.